Former Egyptian president charged with leaking documents to Qatar, declares he doesn't recognize the court's authority. Former Egyptian president Mohammed Morsi was on Sunday placed on trial on charges of endangering national security by leaking state secrets and sensitive documents to Qatar, but he once again declared that he does not recognize the court’s authority. Morsi, who was toppled by the army in 2013 after mass protests against his rule, insisted that he was still Egypt’s legitimate president, Reuters reported from Cairo. “This court does not represent anything to me,” declared Morsi, who was on trial with 10 other people. The maximum penalty if he is convicted is death. The former Islamist president is facing several trials in Egypt. In one trial he is being accused of inciting the killings of opposition protesters outside the presidential palace in December 2012. Another of Morsi’s trials cites his role in a 2011 jailbreak which saw the deaths of several police officers. A fourth trial will be held over charges of insulting the judiciary. In yet another one he is accused, along with 35 others, of working with Lebanese and Palestinian Arab groups to carry out terror attacks in Egypt. 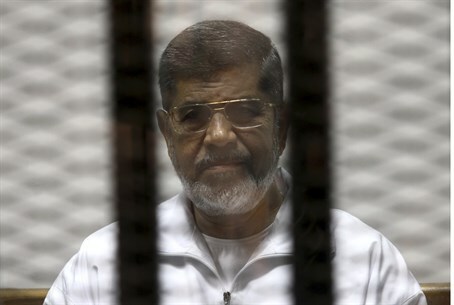 The trial which began Sunday revolves around allegations that Morsi leaked secret documents to Qatar and its satellite news channel Al Jazeera. Relations between Qatar and Egypt have been icy since July 2013 when the army overthrew Morsi and launched a security crackdown against the Muslim Brotherhood. Lately, however, Qatar and Egypt have been trying to restore their ties. In December, Qatar declared its support for Egypt under President Abdel Fattah al-Sisi, despite his crackdown on the Muslim Brotherhood. Sisi later met with an envoy from the Gulf emirate, and Al-Jazeera also shut down its Egypt channel, quieting a major source of tension between the two countries.